Highlights: The fourteenth meeting of the Conference of the Parties to the Basel Convention (BC COP-14) will be held back to back with the ninth meeting of the Conference of the Parties to the Rotterdam Convention (RC COP-9) and the ninth meeting of the Conference of the Parties to the Stockholm Convention (SC COP-9) from 29 April to 10 May 2019, in Geneva. The theme of the meetings will be " Clean Planet, Healthy People: Sound Management of Chemicals and Waste". The meetings will include joint sessions covering matters of relevance to at least two conventions and separate sessions of the meetings of the each of the three COPs. The meetings will not feature a high-level segment. 1. At its fourteenth meeting, the Conference of the Parties to the Basel Convention on the Control of Transboundary Movements of Hazardous Wastes and Their Disposal is expected to elect the officers of the Conference of the Parties who will serve during its fifteenth meeting and the officers of the Open ended Working Group of the Basel Convention. The present note provides information regarding these elections. 1. In its decision BC-13/1, on the strategic framework for the implementation of the Basel Convention for 2012–2021, the Conference of the Parties to the Basel Convention on the Control of Transboundary Movements of Hazardous Wastes and Their Disposal acknowledged that the midterm evaluation report could not be prepared owing in part to the low level of responses to the request for information in support of the indicators listed in section V of the strategic framework for the implementation of the Basel Convention for 2012–2021 (decision BC-10/2, annex). 1. In its decision BC-13/2, on the follow-up to the Indonesian-Swiss country-led initiative to improve the effectiveness of the Basel Convention on the Control of Transboundary Movements of Hazardous Wastes and Their Disposal, the Conference of the Parties welcomed the ratification and acceptance by additional Parties of the Amendment to the Basel Convention set out in decision III/1, known as the Ban Amendment (UNEP/CHW.13/4), and called on Parties to ratify the Amendment. 1. In paragraphs 9 and 10 of its decision BC-13/2, on the follow-up to the Indonesian-Swiss country-led initiative to improve the effectiveness of the Basel Convention, the Conference of the Parties extended the mandate of the expert working group on environmentally sound management, adopted the work programme of the group set out in annex I to that decision, and requested it to develop and implement its work programme, subject to the availability of resources. 1. As is mentioned in document UNEP/CHW.14/5, the annexes to the present note set out the revised draft practical manuals on extended producer responsibility and financing systems for environmentally sound management. 1. By decision BC-13/4, on technical guidelines on the environmentally sound management of wastes consisting of, containing or contaminated with persistent organic pollutants, the Conference of the Parties to the Basel Convention on the Control of Transboundary Movements of Hazardous Wastes and Their Disposal adopted a set of six technical guidelines, requested the Secretariat to disseminate the guidelines to Parties and others, and invited Parties and others to use them and to submit comments on their experience in doing so. 1. As is mentioned in document UNEP/CHW.14/7, the annex to the present note sets out the draft updated general technical guidelines on the environmentally sound management of wastes consisting of, containing or contaminated with persistent organic pollutants. 1. As is mentioned in document UNEP/CHW.14/7, the annex to the present note sets out the draft technical guidelines on the environmentally sound management of wastes consisting of, containing or contaminated with short-chain chlorinated paraffins. 1. As is mentioned in document UNEP/CHW.14/7, the annex to the present note sets out the draft updated technical guidelines on the environmentally sound management of wastes consisting of, containing or contaminated with hexabromodiphenyl ether and heptabromodiphenyl ether, or tetrabromodiphenyl ether and pentabromodiphenyl ether or decabromodiphenyl ether. 1. As is mentioned in document UNEP/CHW.14/7, the annex to the present note sets out the draft updated technical guidelines on the environmentally sound management of wastes containing or contaminated with unintentionally produced polychlorinated dibenzo-p-dioxins, polychlorinated dibenzofurans, hexachlorobenzene, polychlorinated biphenyls, pentachlorobenzene or polychlorinated naphthalenes or hexachlorobutadiene. 1. As is mentioned in document UNEP/CHW.14/7, the annex to the present note sets out the draft updated technical guidelines on the environmentally sound management of wastes consisting of, containing or contaminated with hexachlorobutadiene. 1. As is mentioned in document UNEP/CHW.14/7, the annex to the present note sets out the suggestions for amendments to the technical guidelines on transboundary movements of electrical and electronic waste and used electrical and electronic equipment, in particular regarding the distinction between waste and non-waste under the Basel Convention adopted on an interim basis by the Conference of the Parties at its twelfth meeting. 1. In paragraph 2 of its decision BC-13/7, on cooperation with the World Customs Organization and its Harmonized System Committee, the Conference of the Parties to the Basel Convention on the Control of Transboundary Movements of Hazardous Wastes and Their Disposal requested the Secretariat to continue, under the guidance of the Open-ended Working Group, its cooperation with the Harmonized System Committee and relevant subcommittees of the World Customs Organization in order to facilitate the inclusion of wastes covered by the Basel Convention in the Harmonized Commodity Description and Coding System (hereinafter the Harmonized System) and to report on progress in that regard to the Open-ended Working Group at its eleventh meeting and the Conference of the Parties at its fourteenth meeting. 1. In paragraphs 9 and 10 of its decision BC-13/2, on the follow-up to the Indonesian-Swiss country-led initiative to improve the effectiveness of the Basel Convention, the Conference of the Parties extended the mandate of the expert working group on environmentally sound management, adopted the work programme of the group set out in annex I to that decision, and requested it to develop activities, subject to the availability of resources, to implement its work programme. 1. In paragraph 2 of decision BC-13/17, on the work programme and operations of the Open-ended Working Group for the biennium 2018–2019, the Conference of the Parties to the Basel Convention on the Control of Transboundary Movements of Hazardous Wastes and Their Disposal requested the Secretariat to prepare, for the consideration of the Open-ended Working Group at its eleventh meeting, a document containing options on how to move forward on electronic approaches to the notification and movement documents, taking into account the note by the Secretariat on the Committee Administering the Mechanism for Promoting Implementation and Compliance (UNEP/CHW.13/9), the note by the Secretariat entitled “Control system: electronic approaches to the notification and movement documents” (UNEP/CHW/CC.12/11/Add.2) and the results of a further survey on the issue, in particular through the gathering of more recent information from Parties and others on existing electronic approaches. 1. In paragraph 5 of decision BC-13/17, on the work programme and operations of the Open-ended Working Group for the biennium 2018¬–2019, the Conference of the Parties to the Basel Convention on the Control of Transboundary Movements of Hazardous Wastes and Their Disposal requested the Secretariat to prepare, for consideration by the Open-ended Working Group at its eleventh meeting and subject to the availability of resources, a document compiling information on existing activities that address waste containing nanomaterials and identifying issues related to waste containing nanomaterials that may be relevant to work under the Convention and on options for further work that may be carried out under the Basel Convention related to waste containing nanomaterials within the scope of the Convention, avoiding duplication with activities relating to the matter in other forums. 1. By decision BC-13/9, the Conference of the Parties to the Basel Convention on the Control of Transboundary Movements of Hazardous Wastes and Their Disposal approved the work programme of the Committee Administering the Mechanism for Promoting Implementation and Compliance for the biennium 2018–2019, set out in the annex to that decision. As is mentioned in document UNEP/CHW.14/13, the annex to the present note sets out the draft revised guidance document on improving national reporting by Parties to the Basel Convention prepared by the Committee Administering the Mechanism for Promoting Implementation and Compliance of the Basel Convention. The present note, including its annex, has not been formally edited. As is mentioned in document UNEP/CHW.14/13, the annex to the present note sets out the draft guide for the development of national legal frameworks to implement the Basel Convention prepared by the Committee Administering the Mechanism for Promoting Implementation and Compliance of the Basel Convention. The present note, including its annex, has not been formally edited. As is mentioned in document UNEP/CHW.14/13, the annex to the present note sets out the draft guidance to improve the implementation of paragraph 11 of Article 6 of the Basel Convention on insurance, bond and guarantee prepared by the Committee Administering the Mechanism for Promoting Implementation and Compliance of the Basel Convention. The present note, including its annex, has not been formally edited. As is mentioned in document UNEP/CHW.14/13, the annex to the present note sets out the draft benchmark report aimed at facilitating reporting under paragraph 3 of Article 13 of the Basel Convention - examples reflecting Parties’ good practices, prepared by the Committee Administering the Mechanism for Promoting Implementation and Compliance of the Basel Convention. The present note, including its annex, has not been formally edited. 1. In its decision BC-13/2, on the follow-up to the Indonesian-Swiss country-led initiative to improve the effectiveness of the Basel Convention on the Control of Transboundary Movements of Hazardous Wastes and Their Disposal, the Conference of Parties, among other things, established an expert working group on the review of Annexes I, III and IV and related aspects of Annex IX, with a mandate and terms of reference as set out in annex II to that decision. 1. In its decision BC-13/10, on national legislation, notifications, enforcement of the Convention and efforts to combat illegal traffic, the Conference of the Parties to the Basel Convention on the Control of Transboundary Movements of Hazardous Wastes and Their Disposal invited Parties to share various kinds of information related to the fulfilment of their obligations under the Convention, including the texts of national legislation and other measures adopted by them to implement and enforce the Convention; information on best practices in preventing and combating illegal traffic; national definitions of hazardous wastes; and information on import or export restrictions or prohibitions. 1. In paragraph 9 of section II of decision BC-13/11, on technical assistance, the Conference of the Parties to the Basel Convention on the Control of Transboundary Movements of Hazardous Wastes and Their Disposal requested the Secretariat to take the steps necessary to effect the signing, pursuant to decision VI/3, of a framework agreement with the Government of Slovakia to formalize the establishment of the Basel Convention Regional Centre for Central and Eastern European Countries in Slovakia. 1. By its decision BC-13/12, on the Partnership for Action on Computing Equipment, the Conference of the Parties to the Basel Convention on the Control of Transboundary Movements of Hazardous Wastes and Their Disposal, among other things, disbanded the working group of the Partnership for Action on Computing Equipment and invited interested Basel Convention regional and coordinating centres to take the lead in the implementation of activities listed in the work programme set out in the concept note on a follow-up partnership to the Partnership for Action on Computing Equipment (UNEP/CHW.13/INF/31/Rev.1, annex II) and to propose, based on the work undertaken, further development of the concept at the regional or international level, as the need arises, and to report, through the Secretariat, on the implementation of the work to the eleventh meeting of the Open-ended Working Group. 1. The Conference of the Parties to the Basel Convention on the Control of Transboundary Movements of Hazardous Wastes and Their Disposal, by its decision BC-13/17, adopted the work programme of the Open-ended Working Group for the biennium 2018–2019 and decided that the eleventh and subsequent meetings of the Open-ended Working Group would be of four days’ duration, with two days of plenary sessions with simultaneous interpretation provided, plus one additional day of plenary sessions with interpretation provided subject to the availability of resources, to be applied flexibly by the Executive Secretary, and invited those in a position to do so to provide voluntary funding for any interpretation not included in the core budget. 1. The provisions pertaining to the proposal, adoption and entry into force of amendments to the annexes to the Basel Convention on the Control of Transboundary Movements of Hazardous Wastes and Their Disposal are set out in Articles 17 and 18 of the Convention. As is mentioned in the note by the Secretariat on strategic framework (UNEP/CHW.14/3), the annex to the present note sets out the revised draft compilation of information related to the indicators to be used for the preparation of the final evaluation of the strategic framework, prepared by the Secretariat in consultation with the small intersessional working group on the strategic framework, and taking into account discussions at the eleventh meeting of the Open-ended Working Group. The present note, including its annex, has not been formally edited. As is mentioned in the note by the Secretariat on development of guidelines for environmentally sound management (UNEP/CHW.14/5), the annex to the present note sets out the revised draft practical manual for stakeholders to ensure that notifications of transboundary movements meet environmentally sound management requirements prepared by the expert working group on environmentally sound management. The present note, including its annex, has not been formally edited. As is mentioned in the note by the Secretariat on development of guidelines for environmentally sound management (UNEP/CHW.14/5), the annex to the present note sets out the revised draft guidance to assist Parties in developing efficient strategies for achieving recycling and recovery of hazardous and other wastes prepared by the expert working group on environmentally sound management. The present note, including its annex, has not been formally edited. As is mentioned in the note by the Secretariat on development of guidelines for environmentally sound management (UNEP/CHW.14/5), the annex to the present note sets out the revised draft guidance on how to address the environmentally sound management of wastes in the informal sector. The present note, including its annex, has not been formally edited. 1. As is mentioned in the note by the Secretariat on technical guidelines (UNEP/CHW.14/7), the annexes to the present note set out the compilation of comments received from Parties and others on the draft new and updated technical guidelines as per paragraphs 5 and 6 of decision OEWG-11/3. Comments were received from the European Union and its Member States, the European Automobile Manufacturers' Association (ACEA), Bromine Science Environmental Forum (BSEF), Confederation of European Waste-to-Energy Plants (CEWEP), Research and Education Center for Developent (CREPD), European Electronics Recyclers Association (EERA), European HBCD Industry Working Group (HBCD IG), Hazardous Waste Europe and IPEN. As is mentioned in the note by the Secretariat on technical guidelines (UNEP/CHW.14/7), the annex to the present note sets out the draft analysis of candidate persistent organic chemicals recommended for listing by the Persistent Organic Pollutants Review Committee and of the need to update or develop technical guidelines. The draft analysis was prepared by the Secretariat, in consultation with the small intersessional working group on persistent organic pollutant wastes. The present note, including its annex, has not been formally edited. 1. As is mentioned in the note by the Secretariat on technical guidelines (UNEP/CHW.14/7), Argentina and Canada, in consultation with the small intersessional working group on specially engineered landfill and incineration on land, updated the technical guidelines on incineration on land (D10), as set out in the annex to the present note. 1. As is mentioned in the note by the Secretariat on technical guidelines (UNEP/CHW.14/7), Argentina and Canada, in consultation with the small intersessional working group on specially engineered landfill and incineration on land, updated the technical guidelines on specially engineered landfill (D5), as set out in the annex to the present note. 1. As is mentioned in the note by the Secretariat on technical guidelines (UNEP/CHW.14/7), the annexes to the present note set out the compilation of comments received from Parties and others on the draft updated technical guidelines on specially engineered landfill (D5) (Annex I) and on incineration on land (D10) (Annex II) as per paragraphs 4 and 5 of decision OEWG-11/5. Comments were received from El Salvador, the European Union and its Member States and from Hazardous Waste Europe. As is mentioned in the note by the Secretariat on cooperation with the World Customs Organization on the Harmonized Commodity Description and Coding System (UNEP/CHW.14/8), a report on the progress in the work of the Harmonized System Committee and the Harmonized System Review Subcommittee regarding the classification of types of wastes listed under the Basel Convention, in particular electrical and electronic waste, is set out in annex I to the present note. Annex II sets out the revised list of types of wastes submitted by Parties in response to decision BC 10/10, as well as information received from Parties on the types of wastes in the revised list for which it would be useful to propose to the World Customs Organization to introduce codes in the Harmonized System. The present note, including its annexes, has not been formally edited. As is mentioned in the note by the Secretariat on national reporting (UNEP/CHW.14/9), the annex to the present note sets out a table listing reporting and non-reporting Parties for the years 2015 and 2016. As at 30 November 2018, 98 Parties (54 per cent) had reported for the years 2015 and 2016. The present note, including its annex, has not been formally edited. As is mentioned in the note by the Secretariat on marine plastic litter and microplastics (UNEP/CHW.14/11), annexes I and II to the present note set out draft terms of reference for the Basel Convention Partnership on Plastic Wastes and a draft workplan for the working group of the Partnership on Plastic Wastes for the biennium 2020-2021, respectively. The present note, including its annexes, has not been formally edited. As is mentioned in the note by the Secretariat on proposals to amend Annexes II, VIII and IX to the Basel Convention (UNEP/CHW.14/27), the annex to the present note sets out a compilation of the comments received from Parties about the proposed amendments. The present note, including its annex, has not been formally edited. As is mentioned in the note by the Secretariat on proposals to amend Annexes II, VIII and IX to the Basel Convention (UNEP/CHW.14/27), the annex to the present note sets out an explanatory note submitted by the Government of Norway on its proposals to amend Annexes II, VIII and IX to the Basel Convention, in the six official languages of the United Nations. The submission is reproduced as received. The present note, including its annex, has not been formally edited. 1. As is mentioned in the note by the Secretariat on waste containing nanomaterials (UNEP/CHW.14/12), comments received from Parties and others on the report on issues related to waste containing nanomaterials and options for further work under the Basel Convention (UNEP/CHW/OEWG.11/INF/24), are set out in the annexes to the present note. As is mentioned in the note by the Secretariat on Committee Administering the Mechanism for Promoting Implementation and Compliance (UNEP/CHW.14/13), the annex to the present note sets out the report on the evaluation of the amendment to paragraph 9 (c) of the terms of reference of the Mechanism for promoting implementation and compliance with the Basel Convention prepared by the Committee Administering the Mechanism for Promoting Implementation and Compliance of the Basel Convention. The present note, including its annexes, has not been formally edited. As is mentioned in the note by the Secretariat on Committee Administering the Mechanism for Promoting Implementation and Compliance (UNEP/CHW.14/13), the annexes to the present note set out the classification of Parties’ compliance performance with their national reporting obligation for 2014 and 2015 (status as at 15 June 2018) as well as a report on the status of reporting and how to improve the timeliness and completeness of reporting, prepared by the Committee Administering the Mechanism for Promoting Implementation and Compliance of the Basel Convention. The present note, including its annexes, has not been formally edited. As is mentioned in the note by the Secretariat on Committee Administering the Mechanism for Promoting Implementation and Compliance (UNEP/CHW.14/13), the annex to the present note sets out the report on the review of the operation of the implementation fund prepared by the Committee Administering the Mechanism for Promoting Implementation and Compliance of the Basel Convention. The present note, including its annex, has not been formally edited. As is mentioned in the note by the Secretariat on providing further legal clarity (UNEP/CHW.14/14), the annexes to the present note set out the recommendations for revisions to Annex IV and Annex IX (B1110) prepared by the expert working group on the review of the Annexes (annex I), alongside information on the work of the group since the eleventh meeting of the Open-ended Working Group (annex II). The recommendations for revisions to Annex IV and Annex IX (B1110) include corrections made to the version of the recommendations for revisions to Annex IV and Annex IX (B1110) made available to Parties and observers on 8 January 2019, in particular with respect to the description of operations D20, D21, R10 and R17. The present note, including its annexes, has not been formally edited. As is mentioned in the note by the Secretariat on providing further legal clarity (UNEP/CHW.14/14), the annex to the present note sets out a compilation of the comments received from Parties and others on the recommendations for revisions to Annex IV and Annex IX (B1110) prepared by the expert working group on the review of the Annexes. Comments received are also available on the website of the Basel Convention. The present note, including its annex, has not been formally edited. As is mentioned in the note by the Secretariat on Committee Administering the Mechanism for Promoting Implementation and Compliance (UNEP/CHW.14/13), the annex to the present note sets out draft guidance on the implementation of paragraph 4 of article 6 of the Basel Convention on transit transboundary movements prepared by the Committee Administering the Mechanism for Promoting Implementation and Compliance of the Basel Convention. The present note, including its annex, has not been formally edited. As is mentioned in the notes by the Secretariat on the Basel Convention regional and coordinating centres (UNEP/CHW.14/17) and on the Stockholm Convention regional and subregional centres for capacity-building and the transfer of technology (UNEP/POPS/COP.9/17), the annexes to the present note contain the draft evaluation report on the performance and sustainability of the 13 Basel Convention regional and coordinating centres (BCRCs) and the 15 Stockholm Convention regional and subregional centres (SCRCs) prepared by the Secretariat. Annex I sets out a summary of the assessment of the performance and sustainability of the regional centres under the Basel and Stockholm conventions. Annex II sets out a summary of the procurement capacity assessment of the Basel and Stockholm Convention regional centres. Annex III contains the status of the submission of workplans and activity reports by the centres. Annex IV contains the individual draft evaluation reports on the performance and sustainability of the Basel and Stockholm Convention regional centres based on the activity reports for the period 20152018. The present note, including its annexes, has not been formally edited. 1. As is mentioned in the notes by the Secretariat on the Basel Convention regional and coordinating centres (UNEP/CHW.14/17) and on the Stockholm Convention regional and subregional centres for capacity-building and the transfer of technology (UNEP/POPS/COP.9/17), the annexes to the present note set out reports by the Secretariat on the activities of the Basel and Stockholm conventions regional centres, including a compilation of the technology transfer activities reported by the regional centre. As is mentioned in annex IV to the note by the Secretariat on the report on the activities of the Basel and Stockholm conventions regional centres, the annex to the present note sets out a document prepared by the marine litter topic group lead by the Stockholm Convention Regional Centre in Spain as part of its activities under the Convention on the impact of plastic waste, marine plastic litter, microplastics and measures for their prevention and environmentally sound management encouraged by the Conference of the Parties to the Basel Convention and the Conference of the Parties to the Stockholm Convention, in paragraph 14 of decision BC-13/11 and paragraph 12 of decision SC-8/5, respectively. The present note, including its annex, has not been formally edited. 1. 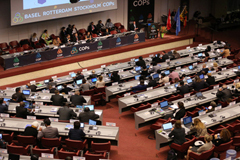 As is mentioned in part I of the note by the Secretariat on the Basel Convention Partnership Programme (UNEP/CHW.14/18), annexes I to IV to the present note were prepared by the interim group on a follow-up partnership to the Partnership for Action on Computing Equipment led by the Basel Convention regional and coordinating centres in Argentina, Senegal, Slovakia and South Africa, for consideration by the Conference of the Parties at its fourteenth meeting. Annex I sets out a concept note, including mechanisms for providing sustainable and predictable financial support for the follow-up partnership; annex II sets out terms of reference for the follow-up partnership; annex III sets out a work programme of the follow up partnership for the biennium 20202021; and annex IV lists recommendations for the establishment of the follow-up partnership. As is mentioned in the note by the Secretariat on the Basel Convention Partnership Programme, Section B on the Environmental Network for Optimizing Regulatory Compliance on Illegal Traffic (UNEP/CHW.14/18), the annex to the present note sets out a progress report by the chair of the Network, Ms. Irma Gurguliani (Georgia). The present note, including its annex, has not been formally edited. As is mentioned in the note by the Secretariat on the Basel Convention Partnership Programme (UNEP/CHW.14/18), the annex to the present note sets out the revised draft overall guidance document on the environmentally sound management of household waste prepared by the household waste partnership working group. The present note, including its annex, has not been formally edited. As is mentioned in the note by the Secretariat on the Basel Convention Partnership Programme (UNEP/CHW.14/18), the annex to the present note sets out a report on evaluating past and ongoing partnerships and sets out recommendations on opportunities to further develop partnerships under the Basel Convention. The present note, including its annex, has not been formally edited. 1. By its decision BC-10/28, the Conference of the Parties to the Basel Convention on the Control of Transboundary Movements of Hazardous Wastes and Their Disposal adopted financial rules for the operation of the Conference of the Parties, its subsidiary bodies and the Secretariat. Paragraph 1 of rule 3, which deals with the budget, requires the Executive Secretary to dispatch information on actual income and expenditure for each year of the previous biennium and estimates of actual expenditures in the current biennium, to all Parties to the Convention at least 90 days before the opening of the meeting of the Conference of the Parties at which the budget for a given biennium is to be adopted. 1. The annexes to the present note contain information on pledges and contributions to the technical cooperation and voluntary special trust funds of the Basel, Rotterdam and Stockholm conventions received in the biennium 20182019 as at 3 April 2019. Annex I contains an overview of such pledges and contributions received from Parties. Annex II contains information on such pledges and contributions for each programme of work activity in relation to the approved budgets for the biennium 2018–2019. Annex III contains more detailed information on pledges and contributions received by Party. All amounts are in United States dollars, unless otherwise stated, and include programme support costs. As is mentioned in the note by the Secretariat on the Committee Administering the Mechanism for Promoting Implementation and Compliance (UNEP/CHW.14/13), the annex to the present note sets out a list of past and present Committee members identifying the 10 members whose terms will expire at the close of the fourteenth meeting of the Conference of the Parties. The present note, including its annex, has not been formally edited. 1. In section III of decision BC-13/11, the Conference of the Parties to the Basel Convention welcomed the active engagement of the Joint United Nations Environment Programme/Office for the Coordination of Humanitarian Affairs Environment Unit (JEU) with regard to emergency situations and encouraged its continued cooperation with the Secretariat. In the same decision, the Conference requested the Secretariat, subject to the availability of resources, and invited the Basel Convention regional and coordinating centres, to continue to carry out capacity building activities with relevant partners, such as the JEU, relevant to the prevention of incidents and enhancing the preparedness of countries to deal with emergencies caused by transboundary movements of hazardous and other wastes and their disposal. The Secretariat was also requested to continue its cooperation and collaboration with the JEU. The annex to the present note sets out a list of bodies and agencies that had not previously been admitted to meetings of the Conference of the Parties to the Basel Convention on the Control of Transboundary Movements of Hazardous Wastes and Their Disposal and that are requesting admission to participate in such meetings as observers in accordance with rule 7 of the Rules of Procedure for meetings of the Conference of the Parties to the Basel Convention, as at 17 April 2019. A list of bodies and agencies that have been previously admitted to meetings of the Conference of the Parties is available on the Basel Convention website. The present note, including its annex, has not been formally edited. The annex to the present note sets out a provisional list of meeting documents for the fourteenth meeting of the Conference of the Parties to the Basel Convention. The documents listed in the annex are grouped according to the items on the provisional agenda for the meeting to which they pertain. Documents that have three document symbols are joint documents that are submitted for consideration by the conferences of the Parties to the Basel, Rotterdam and Stockholm conventions. The present note, including its annex, has not been formally edited.